Team: Whitehead, Murty, Primus, A.Williams, Robinson, Caskey (Evers), Smith, Newman, Igoe (Henderson), M.Williams, Forster. 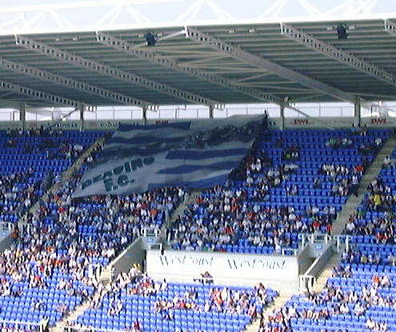 So a few months without football, but at least Reading went out in a bit of style against high-flying in-form Stoke City in front of a large Madejski Stadium crowd enjoying the first real summer weather. 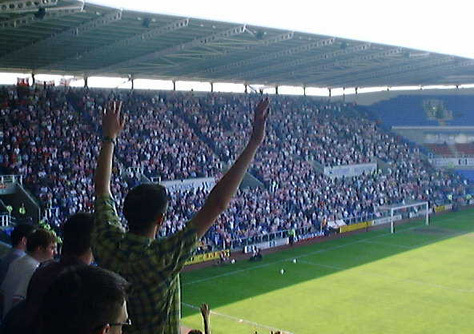 Everyone in the 13,146 crowd, Reading's second highest of the season, went home happy as Reading finished the season on a high by beating Stoke City - who secured their place in the play-offs with Bristol Rovers' defeat at Cardiff City. With nothing resting on the game for Reading, and Stoke needing a point before kick-off for a certain play-off place, it was another great performance that brought three points - and a deserved better finish than last season. Everything points to a top six finish next season for the Royals, who finish this season as the most in-form team in the entire division. For the first half Reading expected Stoke to come at them since they needed something from the game, and overall we were confortable to defend. Stoke, however, looked more than a little nervey in front of a large away following in the South Stand, and they didn't look half as dangerous as you might have expected. Reading looked solid as anything at the back with Adie Williams and Primus looking possibly the best defensive pairing you'll find in Division Two. But it wasn't all about Reading's central defenders - Matthew Robinson and Graeme Murty were both superb as Reading's two full backs - in both winning the ball and then doing something with it. In one thirty second spell Murty summed up Reading's current determination and team spirit with three crunching tackles one after the other to win Reading possession. Robinson was doing the same - chasing every ball at amazing pace, winning it and then playing it forward. Overall the first half was even with 0-0 being the right score at the break. 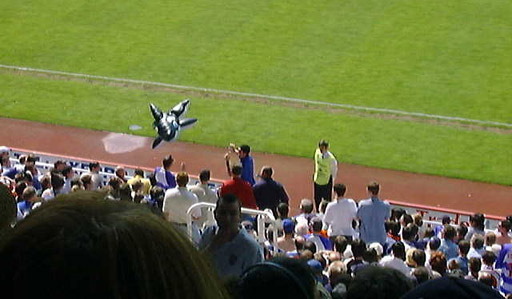 Both sides had a couple of shots - Stoke some long range efforts that hadn't really troubled Whitehead. Reading had the same with Forster having a decent chance after beating two men to break inside the area from the left before shooting wide of the post. Reading gradually got the better of the second half with Stoke seemingly safe with Cardiff doing the job over Bristol Rovers. Forster had another decent chance after more hard work down the left got him inside the box to shoot. Unfortunately the defender was there just in time to block the shot, which lost all power and was easily collected by the keeper. Down the other end Whitehead had a couple of nervous moments but overall had a good game coming well to cleanly catch a whole load of balls pumped into the Reading box by the Stoke wingers. Reading went on the hunt for victory with the introduction of Dariusz Henderson for Igoe who had done plenty of running without much joy. Henderson, with his new glow-in-the-dark blonde bleached head got noticed by getting himself in the right places at the right time and was unlucky not to get his first senior goal for the Royals. After a close opening seventy minutes Reading started to get the better of the game to earn a deserved victory. With ten minutes to go Caskey was caught between two players well inside the Stoke box in front of the East Stand, and brought to the ground. The referee gave the foul, and for a few bizarre moments it seemed like he was going to give it outside the area with Stoke's defence rapidly forming a defensive wall. The linesman flagged for the penalty and eventually the referee followed Caskey over to the linesman for a chat. A few more moments past until the referee at last came to his senses and ended the confusion by pointing to the spot - much to the delight of the home fans. With the goalkeeper moving all over the place on his line Caskey stopped midway in his run-up before blasting the ball to the keepers left to put Reading 1-0 up. Henderson had two decent chances to increase Reading's lead. Firstly he was supplied the ball on the edge of the box, right in the middle, and could have turned and hit it, but took too long. He did better with his other attempt - connecting with his head to send the ball onto the Stoke post. Meanwhile at the other end Whitehead pulled off a great save after a powerful shot sailed in from the edge of the area on target with about five minutes to go. Whitehead dived well and at full stretch stuck his right arm up into the air to tip the shot over the bar for the corner. With the game still in progress the Bristol Rovers result came through, and with Stoke and Reading still battling it out on the pitch the Stoke fans went mental to celebrate their play-off place. Quite rare to see a team that happy at being 1-0 down. At the final whistle the Stoke fans were in party mood while Reading fans were surely thinking of our celebrations this time next year. 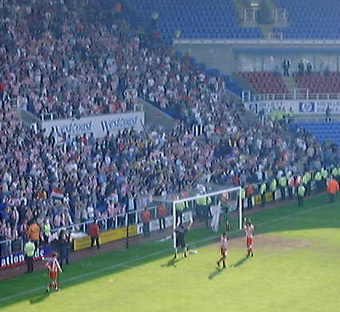 Any possibility of post-match crowd trouble was removed with the Reading win and Stoke's play-off finish - with the Stoke players applauding both the Stoke and Reading fans at the end, it was impossible to leave in anything but a good mood in the blazing hot sunshine. A decent enough game, a great result, and a brilliant atmosphere. The season ends on a big high with Reading in a staggeringly high tenth place. Thanks to the last few months performances and the current set-up at Reading FC we're all left with plenty to look forward to through the summer. First half of season P23 (and that's 12 home and 11 away), W4, D8, L11 Pts 20, guaranteed relegation form and looking like it. Second half of season P23, W12, D6, L5, pts 42 guaranteed playoffs form and looking like it. Determined team, great management, great chairman, superb infrastructure, - how on earth can we screw it up next season?? So if we'd started the season the way we finished we would have got 84 points - very probably enough for an automatic promotion spot! And the encouraging thing is, oddly enough, that there is still room for improvement - a bit more crispness in the passing, retaining the ball a bit more, a bit less of the long ball. But there've been signs aplenty - seen again today - that the quality of the play is getting better. This team does have the potential to be very good. I can't wait for August. Brilliant game and a deserved result in the end. Next year is the year we'll bounce back to div1,can't wait. We need to tie up Ade he was class again and make a couple of signings to improve the squad and we're there. There was no crowd trouble today which makes a nice change apart from the 3-4 prats at the front of the Reading end.Fair play to Stoke players and fans it was a hard fought classic div 2 game and was nice to see there is still sportmanship in the game when there team and some of there the Reading and Stoke fans exchanged in a good round of applause at the final whistle. Murty, Robinson, Whitehead and the two Williams MOM. Great game. Howie is a good keeper but I felt that Whitehead has more authority in goal and kick the ball where he wants it to go. The fans were great and the atmosphere was excellent, however, I wish we could bring back the original Beard Day band with the decent drummer and trumpeters. The one today only knew one song.